Remington, one of American's oldest and best-known gunmakers, exited Chapter 11 bankruptcy in less than two months, the company announced Thursday. The company said it converted $775 million of debt into equity and successfully implemented its plan for reorganization. "It is morning in Remington country," Anthony Acitelli, chief executive officer of Remington, said in a statement. "We are excited about the future - producing quality products, serving our customers, and providing good jobs for our employees." Judge Brendan Shannon approved the exit on Tuesday. Remington had filed for bankruptcy in March. The process was unusually fast for a corporate bankruptcy process, according to Rommel Dionisio, gun industry analyst for Aegis Capital. "That was a relatively quick turnaround to emerge from bankruptcy," he said. "I imagine the improved state of the firearms industry, with increased consumer demand in the three months following the Parkland incident, likely helped banks and other financial institutions gain comfort with the terms of the reorganization." He was referring to a mass shooting that killed 17 students and educators at a high school in Parkland, Florida, in February. The activism of students from Parkland has renewed the debate over gun control. Gun sales tend to rise when gun control enters the national conversation. 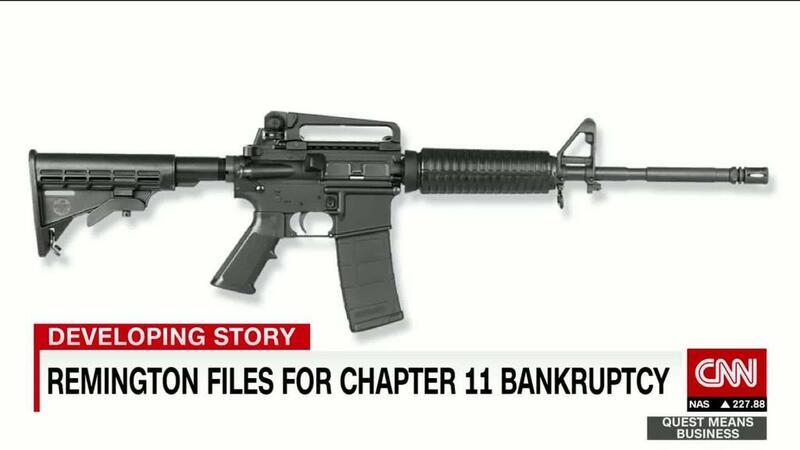 Remington makes the Bushmaster, the AR-15-style rifle that was used in a mass shooting that killed 26 students and educators at a school in Newtown, Connecticut, in 2012. The company is the subject of a class action lawsuit by family members of the victims.